After years of mediocrity, is this the year that Long Beach State finally breaks through and meets expectations? Ever since the Long Beach State men’s basketball team made the NCAA Tournament in 2012, the team has plateaued, having a sub-.500 record in four of the six years since. Last year’s team provided some glimpses as Gabe Levin proved to be the focal point on offense, averaging 18.5 points per game and at one point, scoring 45 points in an overtime loss to UC Davis, tying a 47-year old school record. However that wasn’t enough to get the Beach to the Big West Tournament. With Levin graduating, the team is left without a clear number-one option though head coach Dan Monson isn’t worried. Long Beach State men’s basketball head coach imploring his team during the 2017-2018 season. “We’re gonna hopefully fill in by committee from somebody like Gabe because you’re not going to replace Gabe,” he said. Likewise, senior center Temidayo Yussuf is confident that being the best leader he can will pay dividends during the season. “I’m not really focused on getting more touches or scoring more points,” Yussuf said. “I’m just really trying to do whatever I can to put my team and everybody in the best position to win. At the end of the day, that’s all I want to do is win,” he said. As a result, expect a change in how the offense is run. Last year, Monson elected to go with a post-centric offense, which made sense considering that he had two of the better post players in the Big West Conference. However according to Monson, expect there to be a blend of offensive styles this season, instead of just a singular offensive focus. “Well I think we gotta do both,” Monson said. “We led the league in scoring last year being an inside-out team. “I think what we need to be is more of a defensive-minded team. We have a lot of capable offensive players, we just gotta get everybody buy in on the other end,” Monson concluded. Long Beach State senior center Temidayo Yussuf (4) posting up against Fresno State’s Terrell Carter II (34). With the season a month away, Yussuf is confident that the team will be able to compete with any team in the conference, make it to the Big West Tournament and beyond. “I think this team can achieve a lot,” he said. “We haven’t even, as a team, reached our full potential or even seen what our potential could lead us to be. “I don’t even know how good we could be but we gotta keep working, keep grinding, keep putting the pieces together and once we realize how good we can be, I feel like the sky’s the limit,” Yussuf concluded. It remains to be seen how this year’s team will play and how it will compare to previous teams. Considering that this comes on the heels of a highly divisive response towards Monson’s contract extension, a lot is riding on this season. 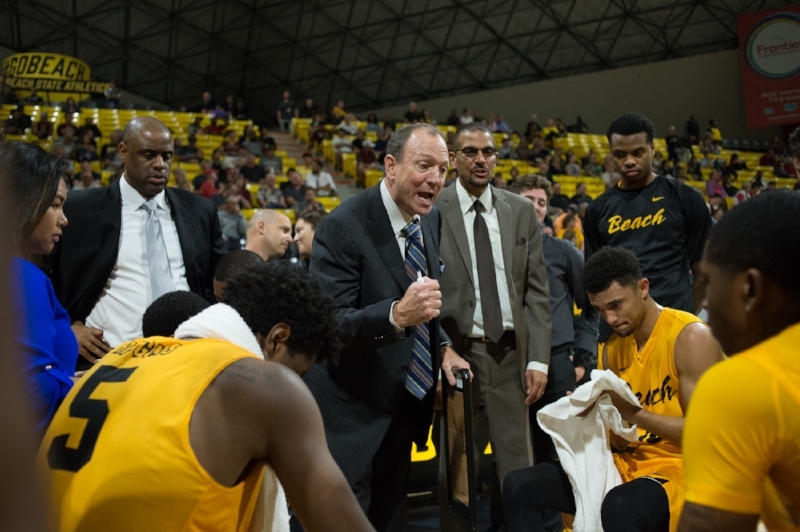 If this season results in failure, it would appear that Long Beach State has lost its luster. However if the team is successful, the Beach might have found gold in Monson’s extension.